Rolls-Royce said it has signed a long-term service agreement with offshore vessel owner Siem Offshore for the maintenance of its deck machinery installations aboard 12 anchor handling vessels. 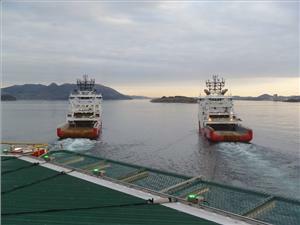 The five-year Maintenance Inspection Program (MIP) is the formalization of a cooperation agreement between the two companies following the delivery of 10 new AHTS vessels in 2010, and two additional AHTS vessels that Siem Offshore took over ship management of in 2017. Jon August Houge, Operations Manager, Siem Offshore, said, "We have had a long-term relationship with Rolls-Royce Marine, as supplier of both propulsion and deck machinery. In our experience, a long-term deal like this provides both parties with predictability and, most importantly, ensures operational stability for our fleet." Jan Tore Varga, Head of Customer support - Deck Machinery and Steering Gear, Rolls-Royce, said, "Rolls-Royce has provided Siem Offshore with maintenance and inspections services ever since these vessels were delivered. That we can now formalize the arrangement is a solid confirmation that Siem sees the commercial and technical benefits of our long-term maintenance planning solutions." Under the agreement, Rolls-Royce will provide the Norwegian operator with a single point of contact for its fleet. For each vessel, a bespoke routine maintenance and inspection plan for all the Rolls-Royce deck machinery installed will be drawn up. This includes 12 low-pressure winch systems, shark jaws and towing pins, stern rollers, as well as 24 steering gears and rudders. The agreement includes provision for Siem to increase its crew's knowledge of the systems and functionalities with in-situ training from Rolls-Royce service engineers when working on board the vessels. The Siem Offshore MIP will also be the first offered with a Rolls-Royce mobile app, which allows the crew to log inspections and tests, and communicate the results to Rolls-Royce for evaluation. The Maintenance Inspection Program can be tailor-made for any type of deck machinery configuration. Jan Tore Varga, said, "Supported by our service team, Siem Offshore crews will be able to work closely together with Rolls-Royce on their maintenance planning. "The benefits of running regular maintenance inspections and communicating them are clear: it will reduce the risk of a system breakdown, allow customers to run predictable operations, minimize a vessel's downtime, and provide expected lower life-cycle costs. For Rolls-Royce there's added value because it allows us to track work on board each vessel more effectively, recommending spare parts, upgrades and overhauls."